The season at SCA’s nurseries has begun in earnest. This year, we are growing almost 100 million seedlings and the first greenhouses are now filling up with plant cassettes where seeds are beginning to grow using heat, water and nutrition. 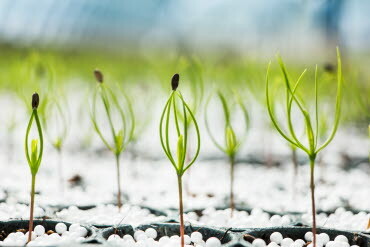 SCA’s seedling operation NorrPlant consists of the Bogrundet and Wifstamon tree nurseries, of which Bogrundet is considered the largest nursery in the world. This year’s sowing season began back in January, and we will now sow 1 million seedlings per day until the beginning of July. The entire sowing process is automated with photocells ensuring that each pot contains a single seed. The pots are placed together in a seedling box and each pot has guide strips and is coated with copper paint to ensure the roots of the seedlings develop optimally and are not deformed. The seedling is kept in the pot until it is planted on the site. “Most of the seedlings we sow this year will be delivered next year. The nurseries here are therefore one year ahead, in order to provide the right seedlings to our customers,” says Thomas Vestman, Head of SCA’s seedling operation NorrPlant. When the spring sun can be felt in the middle of April we begin to open our 18 greenhouses and fill them with seedlings. The seeds germinate and the seedlings begin to grow — thanks to the favorable climate that we carefully control. “Our advanced data system ensures the seedlings grow with the correct irrigation, temperature, fertilization and lighting. The seedlings normally remain in the greenhouses for 3–6 weeks. This gives them a good start and they are well-prepared for outdoor conditions,” explains Thomas. At the end of May, the first seedlings are planted outdoors where they are left to grow. Most spend the winter at the nursery and are then ready for delivery the following spring. At the end of April we begin delivering seedlings to our customers, and these deliveries are then of last years seedlings. Delivery of some of the seedlings sown this year will not begin until the end of July. “During the peak season, we deliver about 1.5 million seedlings per day. We deliver seedlings until October,” says Thomas. During the peak season, more than 50 people work at SCA’s nursery.